There are currently 1 user and 204 guests online. 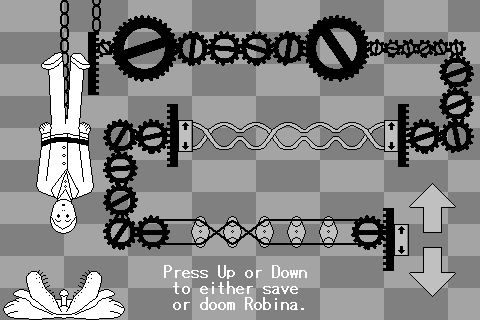 Save Robina from this devious device! Follow the chain of gears, wires and doohickeys to figure out which button will lift her up and which will lower her to her doom. 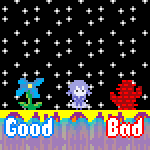 This is basically a remake of this microgame in WarioWare. I was going to make this for Somedays #5 but I got unfortunately sidetracked. This was always one of my favorite Microgames. This is a good recreation of the idea! I can't help but wonder if it wouldn't benefit from some time constraints and maybe some progression? Some other expansion perhaps? It's really cool as is, of course. When I first played this I went the wrong direction because I thought I was supposed to make the toothed bar in the top-left corner go up. Only on the second attempt did I notice that it's actually wrapped around an off-screen pulley. This should probably have a time limit like the microgame it's based off of.